It's an idea that's been kicking around for years — that maybe people don't want to subscribe to music in general. Maybe, in cases of extreme fandom, they want to subscribe directly to the artists they love, without all of the layers of record labels, distributors, online music stores and so on. The fan pays, the fan gets, done deal. We touched on this concept with our idea for true artist radio, and we've seen labels such as Temporary Residence experimented with offering subscriptions to a limited run of curated content, but somehow, nobody has offered a scalable artist subscription until now. 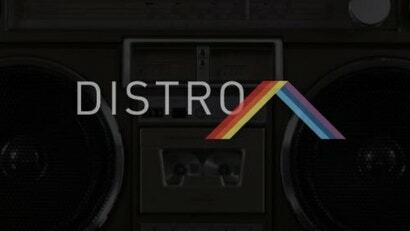 Distro.fm, the brainchild of Kyle Marler, is a non-profit start-up currently seeking funding on Kickstarter, hopes to eliminate every possible middleman between artists and fans, by offering the chance to subscribe to everything a band does for somewhere around $US10 per year. Wants to be embedded everywhere as an option for when fans want to commit to something they've discovered on Pandora, Spotify, etc. A new hashtag-like symbol will refer to distro on T-shirts, the web, etc. It looks like ^slowdance^. The idea behind distro.fm might seem a tad idealistic, but the founder is a lawyer and musician who has thought this through (see interview). The band must send every song, remix, live recording, work in-progress, and other rarity to those fans. Nearly 100 per cent of that money will filter through to the artists. "Too much of the money being exchanged in the music marketplace is going to intermediaries that have nothing to do with the creation of music," wrote Marler to Evolver.fm. "Any fees that we charge for payment processing will only be the bare-minimum required to cover operating costs. No yachts for CEOs." It's a simple web app with a clean interface. Subscribe to one of the relatively few bands or venues using Distro.fm so far (Atlas Sound, Cake Shop, Deer Tick, Lucky Dragons, Oh My Rockness, Phish, Santo's Party House, Slow Dance, Tall Firs, Umphrey's McGee and more — all listed below), and you'll be able to stream and download their music from a simple iTunes-like interface. So far, bands aren't charging for these subscriptions. Distro.fm (direct link) might sound like a utopian pipe dream, but Marler is a lawyer who knows what he is talking about. Lawyers are not inclined towards pipe dreams, as we confirmed in our exclusive, somewhat entertaining interview (edited for length and clarity but still fairly long). 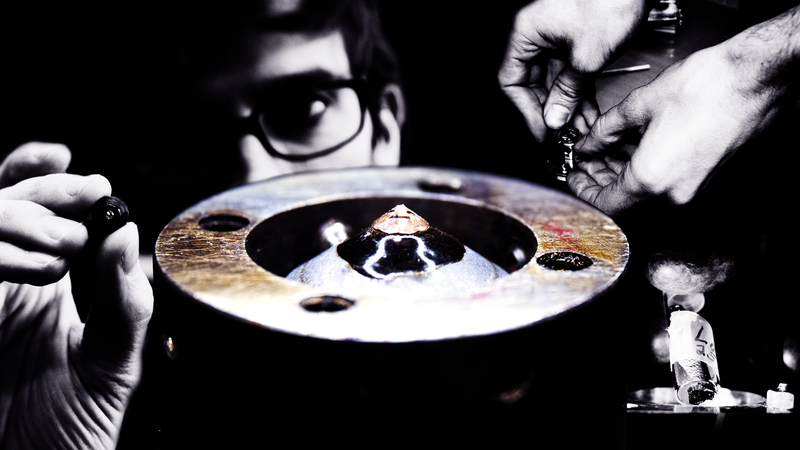 Eliot Van Buskirk, Evolver.fm: So, what is this thing? Kyle Marler, Distro.fm: There are two big takeaways here. One is that we're using a subscription model, instead of a digital music retailer model like iTunes or Amazon MP3. Sometimes people get confused when I say "subscription platform", because Spotify is a subscription-based platform, but you're not subscribing to an artist. That's the model we're using. You pay to subscribe to an artist, and for the next year, you receive whatever music they want to send you. Distro acts as a hub where bands can collect subscribers, upload songs and automatically send it out to all their subscribers. That transaction is made as easy as possible. The other big takeaway is that we're running as a non-profit organisation, so that means we're keeping all of our costs as low as possible, and trying to get outside — like, foundation support, tax-deductible private donations — we're trying to approach it with a different model where it's not controlled by external shareholders. The stakeholders are the people who are actually using the platform — keep costs low and have a community-based approach. Evolver.fm: Where have you guys been? I've been writing about this stuff for 14 years, and it's been one middleman taking over for the next. I've also been thinking that people might want to subscribe to bands, and not necessarily all the music in the world. Is that the idea here? Marler: Yeah, that's the idea. I'm not saying Spotify doesn't have a role to play in the modern music marketplace - I think it's great as a music discovery tool, and if I ran a label, I'd probably have some of my artists' songs on Spotify, so that people can discover them. I'd probably put their music on retail — if people want to buy their songs from iTunes, I wouldn't stop them from doing that. I'd try to have the bulk of my material, plus extra goodies, on Distro.fm to encourage people to subscribe directly to the artists on my label. That way, when the user's year term is getting ready to expire, you can contact those subscribers and say, "Hey, you're subscription's about to run out, how about you resubscribe? Wasn't that an awesome year? Didn't you appreciate that music?" That way you can get a more reliable revenue stream than just putting out an album every year-and-a-half and hoping that the same people buy the album. It's more of a connection. Evolver.fm: You touched on something I'm wondering about here, which is how this thing will ever take off. You recommend putting some of your stuff in Spotify, and I think bands definitely have to put at least something everywhere, but this would be where they put all their eggs, I guess, whereas that used to be the CD. But can bands really pull this off? If I like a band, how would I ever find out that they offer a Distro.fm subscription? Everybody knows to look on Spotify and iTunes, but this seems like a potential, not-insurmountable challenge. Marler: We have a few different tools in the toolbox. One is network handles. 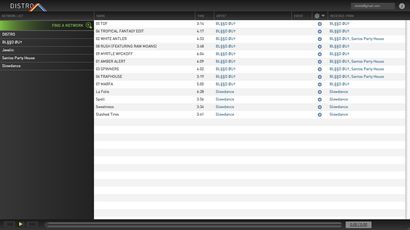 If you go to the network search field on Distro.fm, you'll see that two carets [like ^slowdance^] pop up. When you see the two carets, you can recognise that that's someone's Distro.fm network handle, sort of like a Twitter handle. If a band has that on their T-shirt or stickers or whatever, you can recognise it very easily. Also, we're hoping that bands will take the lead in terms of promoting their Distro network on social media, and we're making that as easy as possible — it's just distro.fm/[your name]. We're also hoping to get Pandora and Spotify integration. When you hear a band using a discovery tool right now, you have options to buy the song. But if I hear a song on Spotify, I might prefer to go to Distro.fm and subscribe to that band directly. We're hoping to have Distro platform marketing from Spotify and Pandora. Evolver.fm: So you're hoping — and you might be right — that Spotify and Pandora aren't competing with you, so they'll be like "Fine, this is just like putting in an iTunes link." Have you approached them? Marler: I have had preliminary conversations with Pandora, but it seems like we're at too early a stage for them to really grasp what it is we're trying to do. But the point of Pandora, in a way, is to help promote artists, so if artists want to promote only their Amazon MP3 link or their BandCamp link, you'd hope that Pandora and Spotify would want to help the artist utilise a non-profit platform. Hopefully that will be an easy sell for them, but people can be pretty protective of their sites. Evolver.fm: One reason they do it is referral fees. Amazon, iTunes — they all pay Pandora and the others a fee for sending customers their way if those people end up buying something. I was just reading that Gawker has seen great success with referral fees too; they made 70 grand in a month without even trying. Are you thinking about a referral fee? 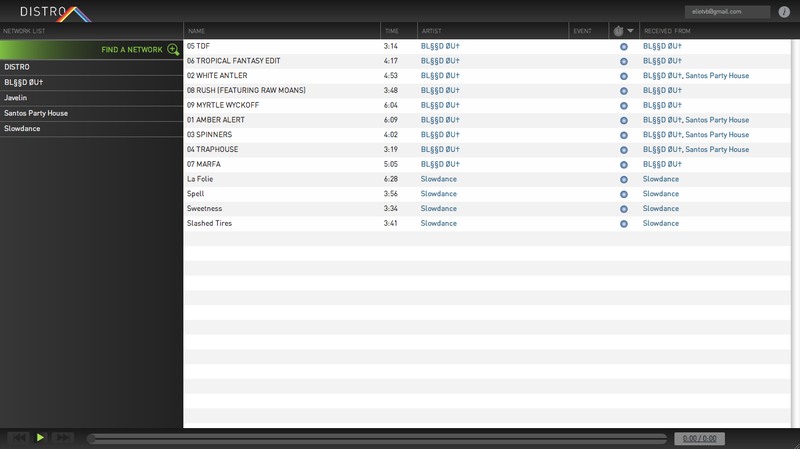 I bet music discovery services will want one, if Distro.fm scales up. Marler: That would make sense. I guess it would be up to the artists and labels [whether to pay referral fees to online radio and other discovery sites]. But it would be great if we could find a way to integrate that. Any way that a band can funnel their traffic to them, instead of to iTunes. I've noticed that a lot of bands will have music on iTunes, but if you go to their website, they'll funnel you to Bandcamp, because that's where they're only losing 10 to 15 per cent of their revenue, as opposed to the 30 per cent that they're dropping in iTunes or Amazon MP3. If we can figure out more ways to funnel people to Distro.fm, if that is the platform that bands want: "If you want to show support to me, go here and subscribe to us." Evolver.fm: It's amazing, I was just looking at an old slide from when I saw Steve Jobs present the iPod (right), and he had this chart and he had calculated that the price of storing one song on a hard drive at that time came out to 30 cents. That could be where he got that 30-percent number, I think, and hard drive prices went down to the floor, and they just left their percentage right there. It's kind of amazing. So why do you think it has taken so long for someone to launch what you're talking about — a direct-to-band subscription service? I've been writing about this stuff for around 14 years, and I've never seen anybody try to do this on a large scale. Why hasn't this happened yet? Marler: Some people I talk to, a light bulb goes off and they say, "This is it." It's like if you see someone playing in the subway and you like their music, you hand them five dollars - this is the next step. You just get music from them. Maybe it's label music, studio recorded music, live music — I mean, the cost of producing music from a live show has gone down so considerably - some bands are like, "That's awesome, and I want to do that." Other people are sitting there scratching their heads. I talk to people at labels, and they say, "That's not how things are done. You find an artist, and you put out the album." That's just how they are, and I bang my head against the wall. If someone were just standing outside and picked up a guitar, and nobody had ever heard music before, today, and they just started playing music, I think we'd have a completely different model. I really don't know why this hasn't surfaced yet. Evolver.fm: So what's the price range that bands will charge per year? Marler: From the market research that we've done, it seems like people are in the $US7 to $US15 range for a year of music. We want to have functionality so that bands can set their own price for their music, also so fans can pay what they want [if that's what the band wants], sort of like Bandcamp. I think out of the gate we might just stick with the $US10 flat subscription rate. I wouldn't want to stop Lady Gaga from charging $US100 if that's what she thinks her music is worth. I also wouldn't want to prevent a band who just wants their fans to dig into their pockets and send whatever they can. Evolver.fm: Is it all streaming? If I'm going to pay, I want the ability to take stuff with me. Is there going to be an app that caches the music, and can you also download the MP3s? Marler: We want to have the music show up in the library for streaming, and you can click on the song to download it. We also want to make it easy to cache on your mobile device - that's a great function of the Spotify app. As things move more towards the cloud, I think the concept of downloading becomes more and more bizarre, but we definitely want people to be able to download, and maybe have functionality similar to BandCamp, where if you want a higher-quality audio file, that's also available. If you are a downloader, I think you should have all the rights that you can to the music. Evolver.fm: I would say don't believe too much in the cloud thing, the way the mobile phone companies work. It's not like a normal internet connection; they own that thing, and I think they're going to stick it to us over the next 20 years on the data plans, especially to consumers who bargain-hunt. Rdio just sent me a survey of users of their iPad app, and offline caching was their number one favourite feature. I'm a "cloud guy", but the mobile phone service providers could be a roadblock to streaming, and keep downloading alive. Back to the money issue. A friend of mine started a non-profit, and he makes a hundred grand a year out of it. Is this going to be a full day job for you? You said you're not going to have a yacht as the CEO, but I would think you'd deserve to earn a living from this. How does that part work? Marler: I would love to have this be my full-time day job, and it's not there right now. I'm a lawyer, so I understand the constraints of structuring a company as a non-profit organisation. Pulling a salary is customary, especially if you're the managing director, which I am starting out as. Eventually, I'd just like to be on the board - I don't see myself necessarily as having this until the day I die. I'd like to get it to a certain point and have a board consisting of people in the music business and the user base take over, and get it to the point where it can fly away. The yacht thing is more, like — there is this incentive structure that comes with for-profit companies, and I've spent a lot of time wandering the halls of the New York tech community and going to a lot of Tech Meet Ups, and there's this "push, push, push, go, go, go, get that early exit, get that Series A [funding]." That is the drive: always to pull money out of the companies, increase the value for shareholders, and try to hit the American Dream and have a fleet of yachts. Every yacht that you buy is money that's flowing out of the music marketplace, by the nature of the platform itself. By running as a non-profit organisation, it means we're only legally allowed to generate enough revenue to cover the operating costs, which includes salaries for staff members. Evolver.fm: As well it should. It's good to hear that you're a lawyer, because lawyers don't have pipe dreams. Marler: Law school is where you go when your pipe dream fades away. Evolver.fm: Are you in a band? Are you a music person? Marler: I've been playing music my whole life. I do a lot of solo music here in New York, I've played in a band in Ho Chi Minh City; Lawrence, Kansas; Los Angeles where I was producing music. That's one of the inspirations behind the platform. I've been creating music under all these different guises, and formations of people, and if someone were able to subscribe to me 10 or 15 years ago, then they could theoretically be getting a stream of music from me, even though I'm sort of wandering around doing different projects. I like the idea of being able to connect with someone and track someone.